Soilborne pathogenic fungi are the most serious group of plant pathogens which cause huge yield losses to crop plants. Because of the complexity in the soil environment and plant disease development, management of plant diseases caused by soilborne pathogenic fungi appears a great challenge for all times. 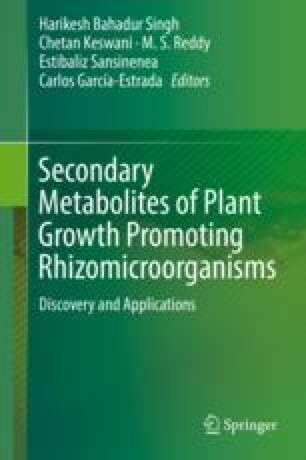 Plant growth-promoting rhizobacteria are important soil microbial communities which are for the past few decades successfully used for the promotion of plant growth and management of plant diseases. Though there are many options available for the management of soilborne pathogens such as agronomic practices, chemical control, and varietal resistance, the biological control using either PGPR or their metabolites offers promising prospects. Agrobacterium, Arthrobacter, Azotobacter, Azospirillum, Bacillus, Burkholderia, Caulobacter, Chromobacterium, Erwinia, Flavobacterium, Micrococcus, Pseudomonas, and Serratia are some of rhizobacteria found associated in the rhizosphere of many plants, while bacteria such as Allorhizobium, Azorhizobium, Bradyrhizobium, Mesorhizobium, and Rhizobium of the family Rhizobiaceae that are found inside the roots together contribute to the collective group of PGPR. Bacillus and Pseudomonas are the two most extensively characterized PGPR genera for their metabolites against plant pathogenic microorganisms including soilborne pathogenic fungi. The metabolites of PGPR contribute to their antagonistic potential by exerting mechanisms such as antibiosis, competition, and induced systemic resistance. Antibiotic metabolites of PGPR such phenazines, pyrrolnitrin, 2,4-diacetylphloroglucinol, pyoluteorin, viscosinamide, tensin, and iturins and volatile metabolites such as hydrogen cyanide and ammonia are having direct antagonistic activity against soilborne pathogenic fungi. Both bioprocess-mediated and genetic engineering-mediated optimization of metabolite production by PGPR have been approached for the production of bioactive metabolites. The metabolites of PGPR could be the potential choice for the effective management of plant diseases caused by soilborne pathogenic fungi because of their advantages such as easy formulation, targeted delivery, and curative effect on plant diseases. NM and CC acknowledge the facilities and support provided by the University of Madras. Author MJ thanks the management and authorities of AMET Deemed to be University for encouragement and facilities.